Peterborough Town skipper David Clarke has described Saturday’s first loss of the season as ‘a huge wake-up call’. 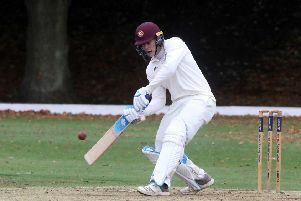 The Northants League Premier Division table-toppers suffered a shock six-wicket defeat at Brixworth after what Clarke described as ‘a pretty poor performance’. He said: “It was a green wicket and was certainly not easy to play on. But we simply didn’t adapt to the conditions. “We were guilty of trying to play our shots too early instead of waiting for the bad balls. “We were all out for 150 and didn’t even bat out our overs. We were about 40 runs short of what would have been a fair score on a wicket like that. “It was a huge wake-up call for us and we now know we’ve got to apply ourselves better if we are confronted with another green wicket like that. “Joe Dawborn (26) and Chris Milner (30) lower down the order showed us how we should have batted. “And so did Brixworth for that matter. They made a much better job of it so fair play to them. “I think a bit of complacency might have crept in as well seeing as we’d been batting quite well. And that will include against next opponents Rushden at Bretton Gate on Saturday, even though they’ve made a poor start to the season and were hammered by 285 runs by Rushton last weekend. “Normally Rushden are one of the stronger teams,” added Clarke, “but they’re not going so well this season. “But they still have some very good players and we must be wary of a backlash after their hammering against Rushton. Town will welcome back spin king Paul McMahon to the team. He missed the Brixworth game due to work commitments. Daniel Mohammed (15) will be the player to make way. Second-placed Oundle also suffered a first defeat of the season. They were at home to Geddington and scored a reasonable 214-7 with Mark Hodgson (75) and Peter Foster (72) forming the baclkbone of their innings. But with opener Amit Dhadwal helping himself to 103, Geddington got home on 218-6 with five overs to spare. In Division Two, a resurgent Peterborough Town second XI sent table-topping Earls Barton packing at Bretton Gate. Richard Kendall (3-41) and Daniel Oldham (3-48) bowled well for Town as the visitors were bowled out for 228 and then some classy batting by Kyle Medcalf (59), Scott Howard (68no) and Oldham (56no) guided Town to 229-3 with almost 10 overs remaining. Oundle breezed into the second round of the Northants Twenty/20 Cup on Tuesday night when thrashing Division One side Weekley & Warkton by nine wickets. They bowled out Weekley for just 82 in 16 overs and then breezed to 83-1 in 4.5 overs with Mark Hodgson smashing an unbeaten 32 off 15 balls and Hanno Kotze 25 off just 10 deliveries. Hodgson hit three sixes and two fours and Kotze one six and four fours. Higham Ferrars conceded their first round tie at Peterborough Town.